This originates from Ibbetson?s 1792 summer tour of North Wales in the company of Robert Fulke Greville (1751-1824). He was in Llangollen in July and there are a number of recorded Llangollen views. 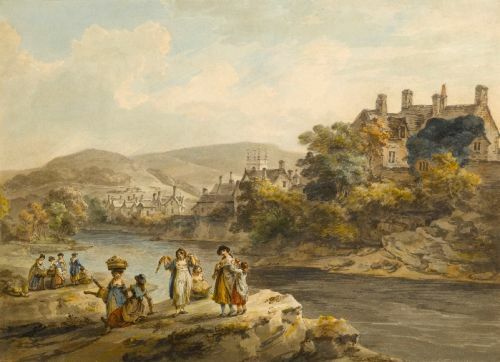 Another version of this watercolour is in the National Library of Wales and an oil in Glasgow Museum. For more on his Welsh trip, see Mary Rotha Clay, Julius Caesar Ibbetson, 1948, p. 32-43. We are grateful to James Mitchell for his help in cataloguing this watercolour.